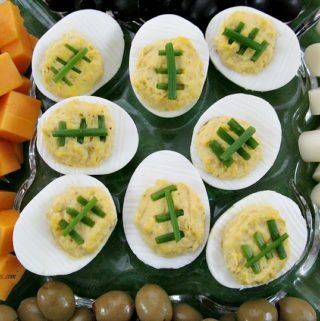 Make these Football Deviled Eggs for your next football themed party. 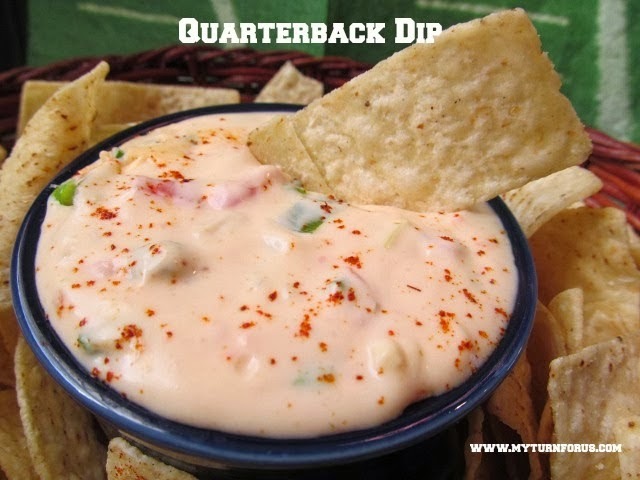 They are one of the easiest football party food ideas for any football party. 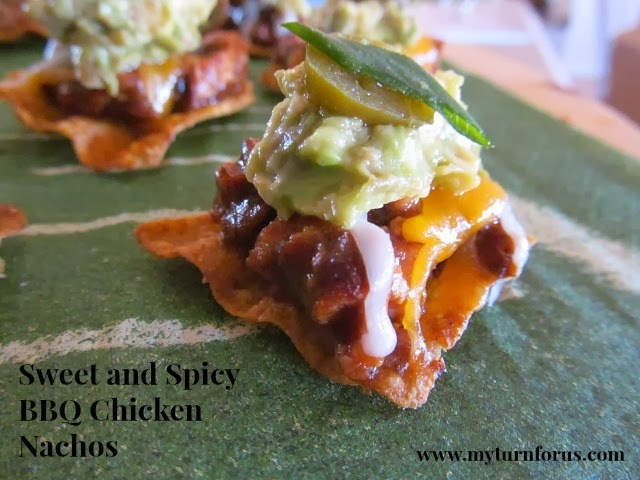 Are you looking for a fun appetizer to serve at your next football party? 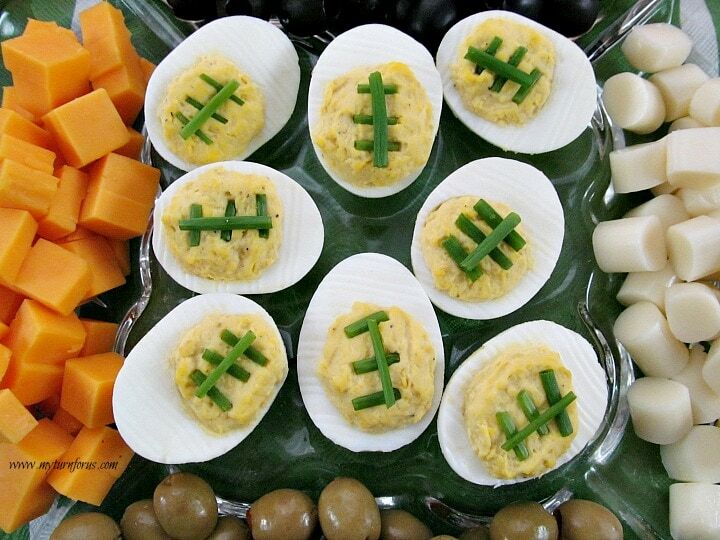 One way to add a little fun to your football themed party is to dress up some of the football snacks. Then you need to try our Football Deviled Eggs, they are not just any deviled eggs, they are deviled eggs styled into footballs. Deviled eggs are always popular at any football party so we made them into football deviled eggs. 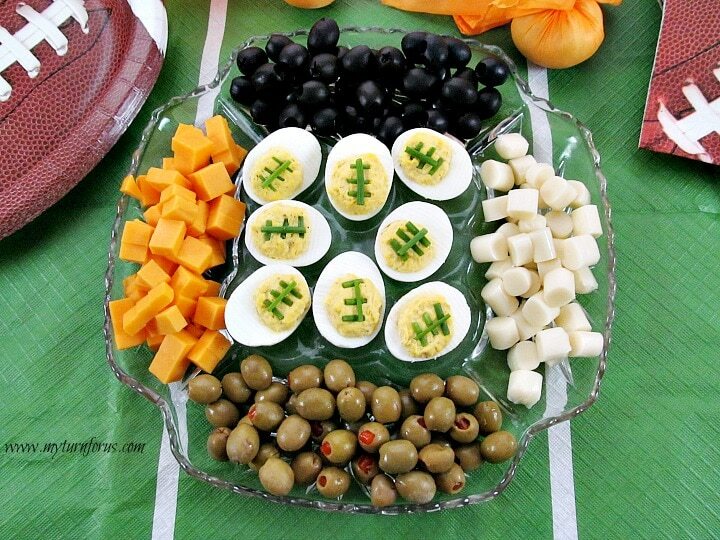 We took the standard deviled eggs and added a few decorations to make football deviled eggs. How easy can that be? And football deviled eggs are easy and inexpensive and that’s always a win-win for us. 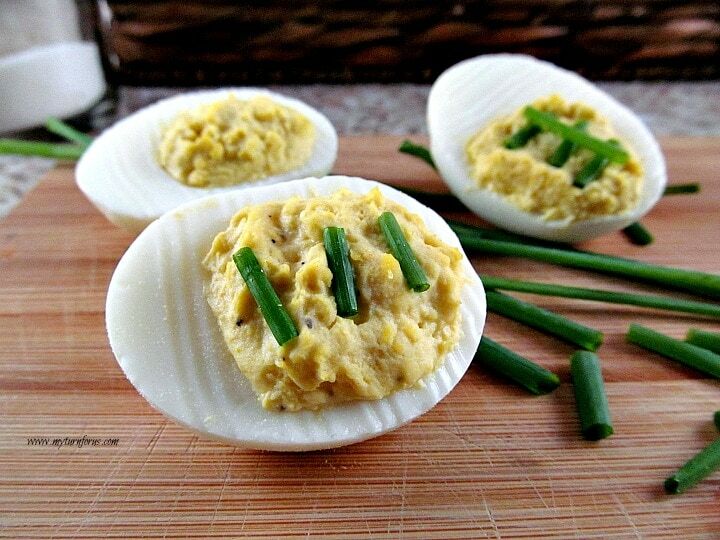 Just a few sprigs of chives and kitchen scissors can easily turn deviled eggs into football eggs. Cut one sprig of chives into three pieces the width of the yellow of the egg and cut another piece the length of each egg yellow. Lay the three pieces of the shorter chives across the width of the yellow and lay the longer piece across the shorter pieces to represent the lacings on a football. 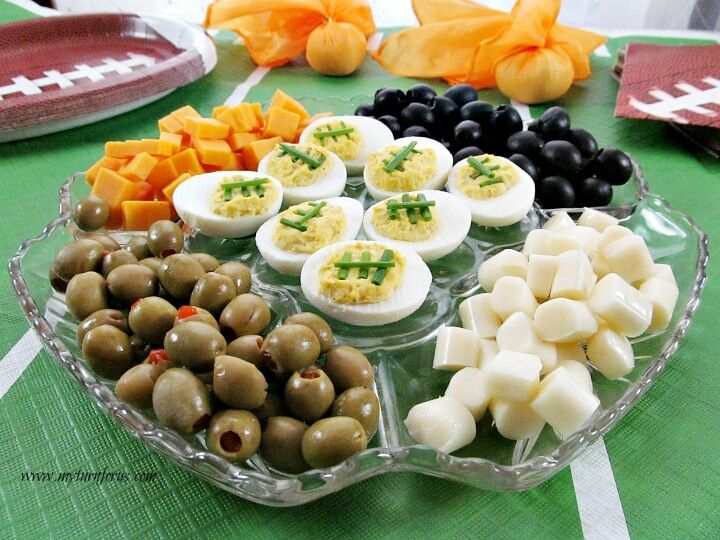 Arrange the eggs on a tray surrounded by olives and different cheeses for a gorgeous football party platter. These Football deviled eggs could also be the main event on a crudité platter surrounded by baby carrots, stuffed celery, sliced cucumbers, and other favorite fresh vegetables. Cook eggs into hardboiled eggs. An egg cooker makes it so easy. Add mayonnaise, yellow mustard, salt, and pepper. I am usually still busy making deviled eggs, when Roy finishes about half of them! I LOVE deviled eggs! Yours are so cute with the chives for football laces.Gosh, I could eat at least two right now. Yum! That is also how I cook my hard boiled eggs; I have never seen leftover Hard boiled eggs from any party function. Cute idea! I also cook my eggs this way – makes them perfect! FUN! We've done these before and they were a big hit!! My husband loves deviled eggs–they are the first thing he'll eat at any potluck–I usually put just a little sweet pickle relish and a tiny bit of onions in mine to give them a little kick. thanks for linking up with us today at Think Outside The Blog! I love this idea! You can turn any type of food into a theme! This will be GREAT addition to parties this year. Yum! We love hard-boiled eggs, and a party or holiday wouldn't be complete unless we had a plate of them on the table. Your recipe is almost exactly like mine, only I add dill pickle relish. I LOVE the cute idea of adding fresh chive to make them look like footballs. these are cute! My husband loves them but only eats the whites, hahha…weird I know. I love him anyway. We add dill pickle relish but otherwise ours are cooked/ made the same 🙂 Mr. B took a couple of dozen to his work pot luck and they were devoured in minutes! Love how you dressed yours up for the big game! I'm in love with these! They are SO cute! I love these! So clever! What a great idea! so festive, and easy, even I can do that! These are adorable! I love creative food…but they're almost too cute to eat! 😉 I'd love for you to link these up at my new linky party to share with my readers! What a clever idea!! I love it! Hello, Evelyn – Thanks for bringing these over to Saturday Dish. Be sure and come back next week for Valentine's Day goodies. It will be fun to see what everyone's best is. Tumbleweed Contessa will be starting a new linky party on Monday, "What'd You Do This Weekend?" Hope you can drop by with anythink at all you would like to link up. Such a cute recipe! Thanks for sharing on Foodie Friends Friday! Sharing with a friend of mine who always makes these eggs for parties. I have never made these! Yours look so cool with the 'laces' on them! Thanks for the tips! It's not a good party without Deviled Eggs, love your presentation. Have a great week and thank you so much for sharing your awesome recipe with Full Plate Thursday. I love deviled eggs. These looks so cute with the little football design. These are so cute! Wish I'd seen them BEFORE the Superbowl! Stopping in today from Lisa's Grand Social. Oh what an adorable idea! I'm passing this on to my favorite football fan! A cute and easy idea. Such a quick way to make for festive football food. Thank you for sharing in the GRAND Social! Really cute,Evelyn! Such a simple thing, but it makes a big difference. Great idea. Deviled eggs are my husband's all time favorite. What a cute idea to add the chives! Thanks for sharing with us at Real Housemoms for Fabulous Fridays! How cute and creative! Love it. Thank you so much for sharing at a Bouquet of Talent. Thanks for linking up another awesome project! Evelyn, these are just as good the second time around. Thanks for linking to Saturday Dishes. I am making these eggs tomorrow for sure! Thanks for a great idea!